Small (6-8) - $47.99 Medium (8-10) - $47.99 Only 6 left! Do you remember how wild our imaginations would run as children? On the playground, with a box of crayons and a few sheets of paper, with two action figures and a bookshelf. Unfortunately, one of our wise friends—an old bearded fellow we know is wise, because his beard rivals even Gandalf—once said the new era of kids belonged to “the heads-down generation.” Use your imagination (because you have honed it so) and picture them, all perpetually peering down at the screens of their smartphones, the LED glow of their hoverboards, and at the mesmerizing holes of their Crocs. We know as well as you, though, that there’s more to life than lithium-ion battery-powered smart devices, that there's inherent value in role-playing on a jungle gym and the like. There are tall trees and whirls of the wind and all the sounds of life in both a rural retreat or a bustling city—all of which are missed when one’s ears are covered by music-blaring headphones. 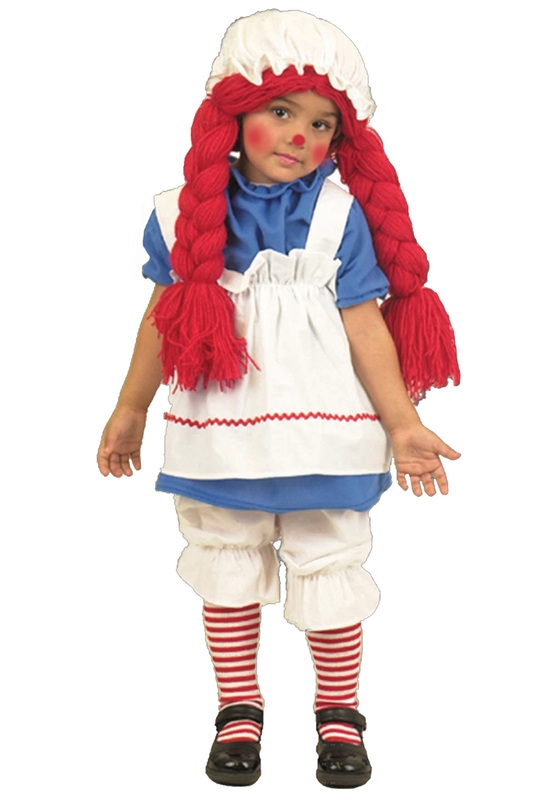 There are other human beings with personalities and dreams and, sometimes, striped outfits with aprons and yarn wigs. The good news: we can actually help your child become one of the latter! Forgo the passé pumpkins and tiresome tropes—and don't even entertain the idea ofa robot costume—and suit your little one up in something truly terrifying: our Girl's Little Rag Doll Costume. It might not be gory or scary, but don’t be surprised when the shrieks ring your ears: your little girl is dressed as a creepy, living, breathing doll, after all! With yarn for hair, a red button nose, and no sense of sartorial boundaries (stripes and an apron? Come on! ), your kid will get a small taste of life 100 years ago—and, we hope, will be able to slow down and enjoy the simple things we did as kids. Like imagining being Mayor of Candyland as she swims in her Halloween haul of lollipops and caramels and gummy worms.